That is me on the photo, it is a bit far away and taken with my Nokia N95. Not very sharp but it gives an idea. Last couple of days the winddirection is NE, that means Amstelmeer is a bit gusty&choppy. 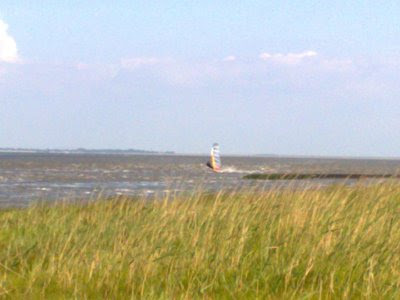 I chose yesterday and the day before to surf on " t Kuitje", this is near the dutch Navy on sea in Den Helder. Both days the windstrenght was average 16-18kn and we got gusts up till 25kn. I just got my own RS:Slalom mkIII 5.5, I used it both days to get a good feeling about the tuning& lowwind performance. Very nice pictures! Chris when will you be back on the water together with the rest of the Amstelmeer crew?? ?